Who doesn’t love a party designed just for you? Guys night will feature a lot of pizza, a lot of energy drinks and of course…a lot of Fortnite! 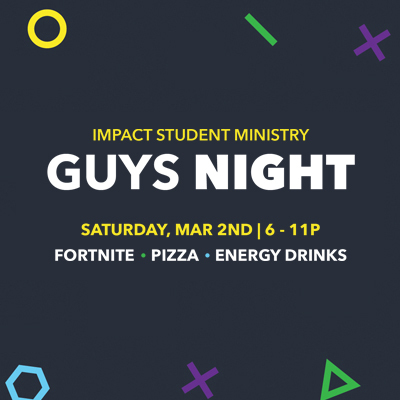 So get the whole squad together and head out to Impact’s Guys Night on Saturday, March 2nd. No bush campers allowed. Cost: This event is 100% FREE but if you’re able to bring an XBOX or monitor, please do.